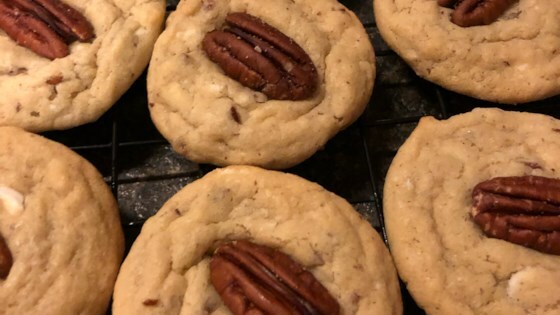 "Soft, smooth white chocolate with a hint of pecan....a very yummy cookie. Chop the white chocolate as course or as fine as you like." Blend sugar and butter together until smooth and creamy. Add the egg and vanilla; blend well. Sift together the flour, salt, and baking powder; combine these ingredients with the creamed mixture. Add chopped white chocolate and nuts. Spoon dough out onto a cookie sheet. Bake at 375 degrees F (190 degrees C) for about 5 to 10 minutes, or until golden brown on the bottom. Let cool slightly on the cookie sheet before removing, or they'll break. These are amazing cookies. I have added about 1/4 cup more of the white chocolate chips and about the same amount more of flour as well. I can't get enough!! A must try!! These cookies are the bomb! I took others suggestions and used extra white chocolate. My husband really enjoyed these! Very good cookie. I would suggest adding more white chocolate, but that's just because I love it!